Flaked wholegrain heritage grain oats, rye and Verival wheat from our contract growers with a blend of crunchy hazelnuts, almonds, cashews, dates, apples, strawberries, raspberries and sour cherries. Finished off with crunchy buckwheat and puffed amaranth. No added sugar**. Deliciously chewy and 100% organic. Good morning! Rye flakes*, wheat flakes*, oat flakes*, crispy buckwheat*, puffed amaranth*, roasted and chopped hazelnuts* 4%, dried date cubes* 4% (dates* 97%, rice flour*), dried apple cubes* 4%, roasted and chopped almonds* 3%, cashews* 2%, strawberry pieces* freeze-dried 1%, raspberry pieces* freeze-dried 1%, sour cherry pieces* freeze-dried 1%. > May contain traces of sesame seeds, soya, lupines and other nuts. 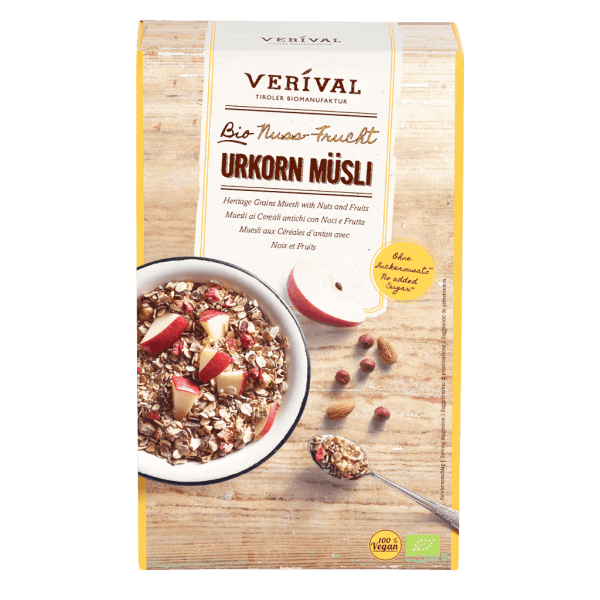 Best enjoyed with milk, natural yoghurt or plant based alternatives. Also perfect as a topping for your breakfast bowl.